Episcopal Missionaries teaching Ojibwe women lace-making, Leech Lake, 1894. Janette (Jeannette) Crooks displaying Battenberg lace piece at Birch Coulee Mission, circa 1900. The Episcopal church in Minnesota had a great presence among the Native American communities throughout the state in the mid to late 19th century. 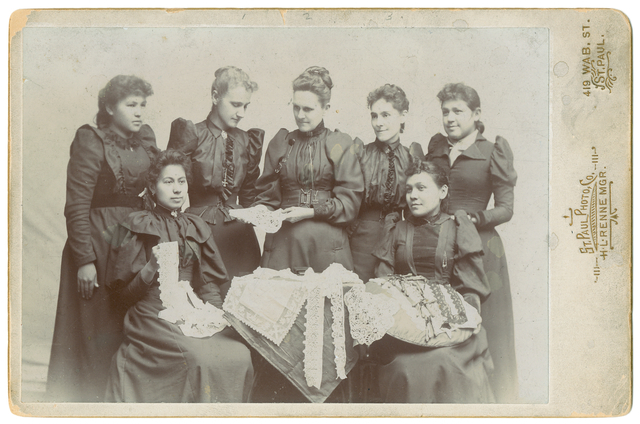 A few of the women who belonged to the church took initiative to attempt to teach Ojibwe and Dakota women to learn lace making. 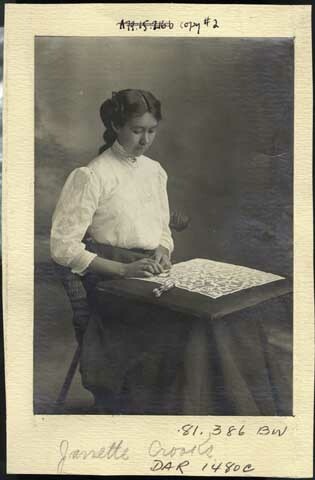 The Minnesota Historical Society has a collection of over 50 pieces of lace and lace making tools from this initiative as well as many photographs of the lace makers. Please visit MNopedia to learn more about the Sybil Carter Indian Lace Association.